Radiant's blog: Why Do You Want To Get Married? 'Why do you want to get married? ', he quizzed me. A thundery silence stole our fairly romantic night as we sat in his car in front of my house. The question tore deep into my soul like a sharp sword would an ice cube. For a moment, I actually didn't know why I wanted to get married. Or rather, I knew, but it was too embarrassing a reason to get married. I mean, if someone else came up with that answer, I'd think she was sick. But as I burrowed into my soul, I knew I had the very same answer. I had never thought about it until then. 'Abuse is inevitable', I said brusquely. He should have known I wasn't comfortable with those questions. He was probing my motives and I felt like I was being stripped naked. How could I tell him that I want to get married because it is what the society expects of me? I concluded my youth service program the other day and everyone's prayer had a good husband element in it. I'd display a picture with a male friend and pings start pouring, asking if he is 'The One'. I'd call home and the conversation will end with one last issue: Is there anyone on the line? But I knew I'd be sticking my neck out to make a decision as crucial as marriage based on that reason. So I decided to find better reasons, cogent reasons. What was the original intent of marriage? I studied the first marriage: between Adam and Eve. I discovered that immediately after God created Adam, he gave him work to do- tend the garden. Then God saw that it wasn't good for him to be alone and he decided to make a helper... Does it mean that the reason his aloneness wasn't good was because of his assignment, not necessarily because he needed someone to talk to (God used to come down in the cool of the evening to have fellowship with Adam). If so, will it be right to say that a man cannot fully accomplish his assignment in life until he gets married? But Jesus didn't get married. Neither did Paul. And they weren't eunuchs, yet they fulfilled their ministries. So why did Adam need help? And what kind of help did Eve offer? Did she till the ground with him? What was Eve's assignment? Was it only to be the mother of all living beings? How does that correlate with the role of a woman today? And sure, we know women with great visions in various spheres of the world. Was she called to only house keeping duties? The mandate to be fruitful and multiply and fill the earth, subdue it and have dominion was given to both the male and the female and I don't think God was talking just about procreation. Economic productivity must have been included. So if both males and females were given this mandate, I should think that women have their roles in the economic sphere, the political sphere, science and inventions, e.t.c. Marriage has experienced a lot of abuse because when the purpose of a thing is not known... (fill in the blank). It's just expected that at a certain stage in life one should pick a life partner and raise children. But then there are many divorces these days that have made people start reconsidering the finality in the concept of marriage and start twisting the rules to suit their failure. 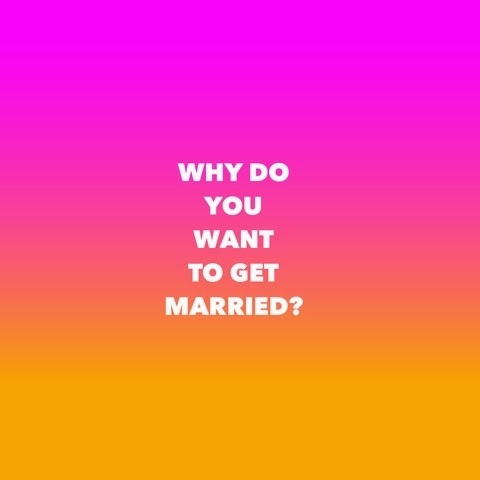 These are questions people intending to get married should ask themselves and seek answers to from the author of marriage Himself before getting into it, to avoid being an additional data to the divorce statistics. I recently came across an article that gave me a different view to the purpose of marriage. Here's an excerpt. The date was May 14th, 2011. It was a Saturday morning and I had such a heavy burden on my heart about not “finding the one” I was at a wedding event the night before and woke up in a really dark place. This was highly unusual because up until that moment, I had zero pressure about getting married.There wasn’t a side comment (about why I wasn’t married) that I didn’t have a smart comeback to. Not this morning. I had nothing. “If I gave you a wife, would you know what to do with her? If I gave you a wife, would you know how to lead her and in what direction? Do you think that the purpose of marriage is simply to fulfil social norm? You want me to find a wife just for you out of 4 billion women because you’re old enough and making enough money to have a wife? How will your marriage fit in heaven’s plan? What kind of home will you build? Do you have a Mission Statement? On and on it went. It was like a truck hit me. But it was a hit I gladly took. I just shut up and wrote everything down. It was like a light bulb went off in my heart. Right away, my prayers changed from “who is she….when will she come… is it this one or that one?” to “What is my Marriage Mission Statement?” What should my family look, feel, walk like? What should my marriage accomplish for the kingdom of God? What should that union do for the kingdom? The smallest unit in the army is the squad (based on the U.S prototype)…made up of 7-14 soldiers and led by a Sergeant. For men, having a family is like being in charge of a squad within Gods army. But a squad that is not connected to the army is pretty much referred to mercenary. So do you want a squad in Gods army? Or are you looking to be a mercenary leader? I agree with the author. However, I don't have all answers yet. I'm still seeking and if you know, I'd like to hear from you. Asking the right and hard questions is just the beginning. Its amazing how much our existence and life changing decisions have been influenced by the society we live in. Exactly the same word that dropped in my spirit! I was pondering the purpose of marriage and it just came: "to raise an army of generations that will be a terror to the kingdom of darkness"
Another thing to note about a life partner: He/she may not be perfect but both must be in perfect union spiritually, mentally and physically. It's tough to think about and sometimes people think you're just being picky but it's the hard truth. And it is possible. Only our Heavenly Father who knows what's best for us can link man and woman in such a perfect manner and He delights to guide us like so. Marriage is an important journey that requires deep and thoughtful preparation because it is a life-changing decision. The Lord will guide us in this. Amen, Warrevs. You're so on point.